I was surprised when I went to Kew Gardens a few days ago. I expected to see the cherry blossom walk (which earned Kew its top spot in my London Cherry Blossom Guide) in full flower, but to be honest, it’s actually still about a week away from its peak. Don’t get me wrong – there’s plenty of wonderful blossom to be seen, but that moment when the sheer mass of it all is overwhelming is yet to come. So what do you get if you go now? Well, quite a lot of white Prunus Shirotae is one answer. Which is not to be sneezed at by any means. It’s in full flower behind the Palm House, at the start of the cherry blossom walk. Where you’ll also find some attractive Prunus Umineko. There’s some more Prunus Shirotae in a pretty woodland setting near the Princess of Wales Conservatory. Nearby you can’t miss the spectacular deep pink blooms of Prunus Lannesiana Matsumae Beni Yutaka. And pale pink Prunus Subhirtella. But my new discovery is this elegant weeping cherry, Prunus Subhirtella Pendular Rubra by the lake in front of the Palm House. I’ve never come across it before, which just goes to show that what cherry blossom you see depends on when you go looking for it. I expect you’ve noticed that I’m able to be specific about the varieties of cherry blossom I saw. That’s because all the trees in Kew Gardens have little labels attached telling you what they are. I wish other parks would do the same. If you want to get an idea of what’s still to come in the cherry blossom line at Kew, take a look at the blossom I saw last year at Kew Gardens. The blossom peaked earlier last year, at the beginning of April. It’s always hard to be specific about timings as so much depends on the weather, but I would guess that if you go to Kew in about a week’s time you may strike peak blossom season. But the avenue of pink Prunus Asano beyond the Temperate House is probably about two weeks away from full flowering – it was in tight bud when I went on 9th April. And the avenue of pink cherry blossom in Greenwich Park was also still in bud on 10th April – maybe it’s the same variety. I saw some fabulous magnolia at Kew too – but I’ll save that for another post. 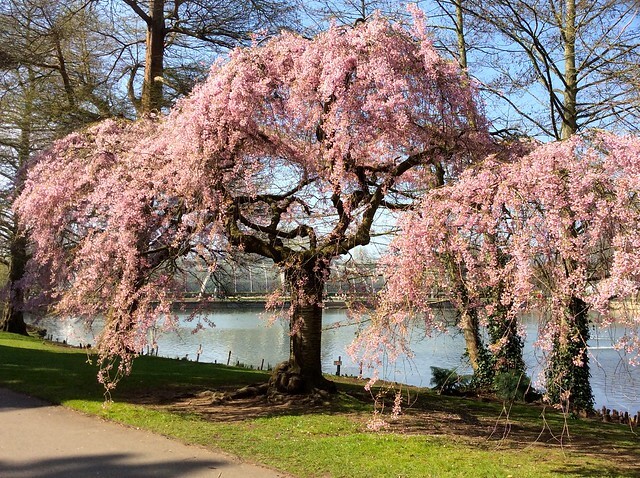 This entry was posted in Cherry Blossom, Flowers and plants, Kew Gardens and tagged flowers, London, nature, plants, Prunus Shirotae by Fran. Bookmark the permalink. What lovely pictures I know it’s who takes them that makes the difference but what camera do you use? Thanks! I use an iPad Mini. Ha! Ha! I almost fell off my chair at your answer. People put so much emphasis on the type of camera people use when it is the person behind the camera that really makes the picture. Thanks! I’ve now graduated to an iPhone 6. I bought the Galaxy S7 for my 17,500km rail odyssey and the pictures are stunning. I had already sold my DSLR and humungous lenses and carried a GoPro, a small Samsung selfie camera for quick videos and selfies and a bridge camera but the phone camera was definitely my favourite (until I sus out the GoPro properly). I have been relying on the Samsung Galaxy S7 and many of the photos for my recent articles were taken on this phone and a bridge camera with a long zoom lens. Who needs to carry a DSLR with heavy lenses these days?